This badge was issued to BCC on 06 Sep 2018. This credential recognizes the recipient organization's achievement as a partner who has developed a software solution for a line of business or industry which runs on Notes and Domino 10. 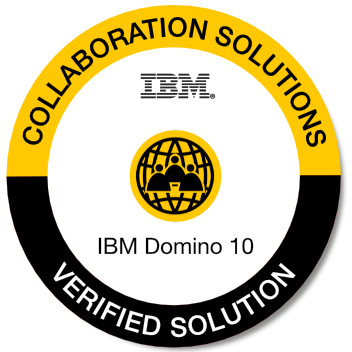 The software solution is fully compatible with IBM Domino v10 and optionally with IBM Notes v10. This partner provides full support from planning to post implementation for customers using IBM Domino v10 with their solution. Provide documented evidence to IBM demonstrating that the solution runs on Notes and/or Domino v10. Evidence can include: Publicly accessible video of Domino 10 or Notes 10 running with the application OR testimonial from a customer about compatibility with v10. To apply for this badge, please e-mail details to alan.hamilton@uk.ibm.com. Administrators looking for an efficient process to manage their daily Notes client management tasks and also support infrastructure projects will find the perfect solution in ClientGenie. DominoProtect boosts the security of your IBM Domino environment, prevents unauthorised changes in real time and ensures regulatory compliance. MailProtect is a one-stop shop for enterprise to protect your mail communication, enhance email based communication, meet todays security and compliance requirements and offers a rule based system central email management to fulfil increasing requirements for todays business critical mail communications. AdminTool securely automates the user and group management processes, standardises changes with workflow approvals and provides comprehensive logging. AdminTool for Connections Cloud securely delegates and automates the user management processes to extend to the cloud. DBTool automates all application management processes, standardises changes with workflow approvals and supports IBM Notes and Microsoft projects with auditing capabilities.